NAE, National Association of Entrepreneurs and Employers held Day of Enterpreneurs for the 17. times this year. At the event all county were represented with more than 600 enterpreneurs. 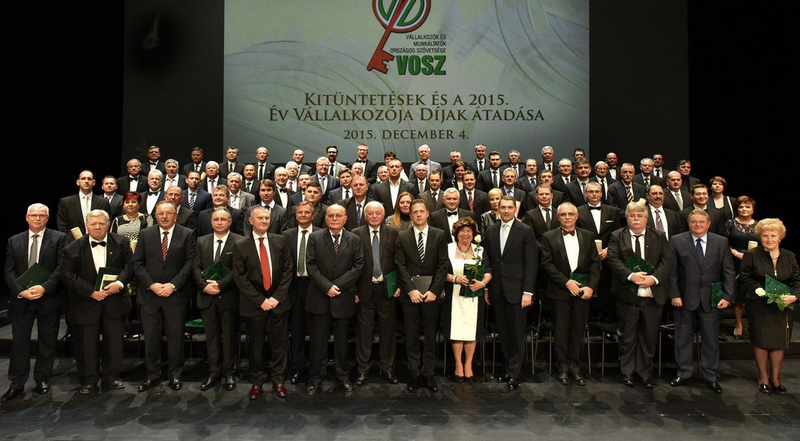 Besides state honours prestigious awards has been given to recognise outstanding Hungarian entrepreneurial achievements. The prises were presented by János Lázár, Minister heading the Prime Minister’s Office. From county Komárom-Esztergom our spinning mill, Hungaro-Len Ltd. won the prise of NAE, General Manager Sándor Nagy got Enterpreneour of The Year title from the Minister. At the event János Lázár told, Hungarian Goverment’s most important allay is the community of hungarian enterpreneurs, which is able to support himself, and provide others with job. Sándor Demján, Executive Chairman of NAE told: as a lobbyst the main function of NAE is discussion, and he welcomed the Minister’s suggestions on developing a cheaper and more efficient State.